Saturday marks one year since the launch of the Great March of Return, a mass mobilization of Palestinian civil society in Gaza. On its first day, March 30th, 2018, around 30,000 Palestinians participated in marches along the fence that walls off the Gaza strip. 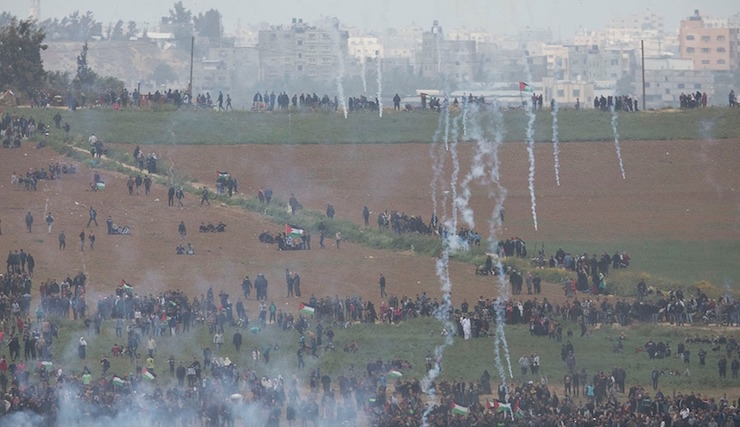 Every Friday since, Palestinians in Gaza have gathered near the fence to demonstrate against the blockade and have been met with tear gas and bullets from Israeli forces. I spoke with Jehad Abusalim, originally from Gaza, and currently a PhD candidate in History and Hebrew and Judaic Studies at New York University and a staff member at the American Friends Service Committee, a Quaker social justice organization. For the last several weeks, he has been traveling the US on a speaking tour with his friend Ahmed Abu Artema, one of the organizers of the Great Return March. This interview has been edited for length and clarity. Naomi Dann: I wanted to start by reflecting on the speaking tour you have been on with Ahmed for the last couple weeks. What’s the most important thing you’ve been trying to convey to US audiences about the situation in Gaza? Jehad Abusalim: We tend to talk about the situation in Palestine through numbers and statistics. We try to measure it by years under occupation. I think sometimes the numbers and statistics, important as they are, make it hard for people to actually imagine what a place like Gaza is like, what we experience. So hearing from Ahmed and me personally about the impacts of Israeli policies and how they affect our lives, how they inflict harm on our children, the trauma they go through, the suffering of our families without electricity, without water . . . It isn’t easy for us to talk about this, and it isn’t easy for people to listen to. But I think this personal element plays an important role in building human bridges that allow for people to make sense of our experience. And then they can choose what to do with what they’ve heard. Knowledge entails responsibility. ND: This week, the AIPAC conference took place amidst a escalation in bombing on Gaza that recalls the devastation of the 2014 attack. How does it feel for you to be watching that from afar? What are you hearing from your family and your friends? JS: I left the Gaza strip in 2013 and I was in the US when the 2014 aggression against Gaza happened. I was living here, and also living on the phone with my family, making sure that they were still alive after this or that bombing. It was really hard. Today, I tend to my life here in the US, I work and pay my bills, while still having to worry that my family’s on the verge of going through another operation like 2014. But this isn’t just me and my family. We’re talking about 2.2 million people who live in the Gaza Strip without shelters to protect themselves from bombing. It’s really painful for me to watch from here. Things keep repeating themselves, and we, as citizens of Gaza, have to make the case over and over again for why we shouldn’t be killed en masse. For why bombs shouldn’t be dropped on people’s houses, killing civilians in a disproportionate manner, and rendering people dead, injured, or homeless. ND: The Great March of Return started as a movement to highlight the roots of this violence: the displacement of Palestinians since 1948. Can you say a little about the conditions and conversations that drove the initiation of the march? JS: The Great March of Return as a grassroots social movement occurred because of a sense of urgency that Palestinian people everywhere, especially those in the Gaza Strip, felt when President Trump came to power in the United States. We saw the worrying signs that came with the Trump administration: first talking about and then actually moving the embassy from Tel Aviv to Jerusalem, ending funding for UNRWA [United Nations Relief and Works Agency for Palestine]—Palestinian refugees all over felt under attack by this administration. The blockade reached an unprecedented zenith in terms of the deterioration of almost all aspects of life in the Gaza Strip in early 2018. And there was the feeling amongst a lot of young people in Gaza that it’s time to take action outside of the rigid and traditional frameworks of political action adopted by the major political factions in Palestine—here I’m talking about either the path of the peace process or the path of armed struggle. The Great March of Return as a moment of mass popular mobilization emerged from this context. It started as an idea proposed on social media by a number of activists, intellectuals, and organizers, including Ahmed. The idea of marching peacefully near the separation fence was met with large-scale interest within civil society in Gaza and amongst youth groups, women’s organizations, unions, academics—individuals who are not affiliated with the major political factions in Palestine. It was exciting for young people in Palestine because they felt that this was an opportunity for them to claim a political sphere that was not controlled by the major factions. Of course, because the political parties are part of the composition of Palestinian society, they also took part in the planning and preparation. The March happened on Land Day, which is a day that commemorates a 1976 mass popular uprising and general strike, organized by Palestinians to protest Israel’s seizure of land from Palestinians within the State of Israel. The march was scheduled on that day to show that the Great March of Return is not an unprecedented event in Palestine, but rather, a new episode in a long history of Palestinian mass mobilization. So the march wasn’t unprecedented in some ways, but also it was unprecedented in the sense that it gave this space to thousands of young people and unaffiliated individuals and groups in the Gaza Strip who wanted to reclaim their place in politics. ND: There have been protests happening every week, and there is a big mobilization today for the one year anniversary. When you look at what’s happening today do you feel like the spirit that drove this movement is still there or has it become something else? JS: Israel’s response that first day set the terms for how the rest of the march would look. On the very first day, Israel led an assault against the march. More than 15 people were killed. Around 1500 were injured. By inflicting this huge number of casualties, Israel killed the potential for this peaceful protest to grow and become something larger. People protested because they wanted the world to pay attention to the refugee issue, to the blockade. The protestors were not met with serious interest on the part of Israel, nor the international community. They were met instead with bullets. In the last year, more than 260 people have been killed and more than 20,000 injured in the marches. The question about the outcomes of the Great March of Return needs to be directed to those who met the protest with these deadly tactics. Palestinians are always asked to do their homework, to choose the proper tactic. If there’s one thing we have been dealing with throughout the entire 70 years of our struggle, one consistent weapon used against us, it’s that no matter what Palestinians do, no matter which tactics they use, they’re always met with violence. And the discourse in mainstream media will play into dehumanizing Palestinians no matter what. ND: There has been a lot of change in how Palestine and Israel are discussed in US politics over the last couple years, mostly during the period that you have been living in the US. What, if anything, do you find hopeful? JS: I think an important shift has taken place. For decades, Palestinians in the US have been organizing and advocating for the Palestinian struggle for self-determination and freedom. I’m really glad that finally, after these long years, those Palestinian voices are being heard. The shift in US politics is due to the great work of the Palestine rights movement, our Jewish friends, our allies in the faith communities, the human rights organizations, and on campuses. These conversations are beginning to address the issues that the internationally adopted peace process framework has failed to address, like the right of return, Palestinian self-determination, and the rights of Palestinians in Israel. This shift is important, but I’m concerned about the current pace [of change]. Things that require a sense of urgency need more action, especially the blockade on the Gaza Strip. We are approaching the year 2020; UN reports from 2012 stated that Gaza would be unlivable 10 months from now. It’s exciting to see this political shift take place and to see the conversation change, but this shift in the conversation needs to turn into a shift in policies sooner rather than later. Naomi Dann is a writer and communications professional in Brooklyn, NY.